The fry in the bottom pond have been growing like stink. 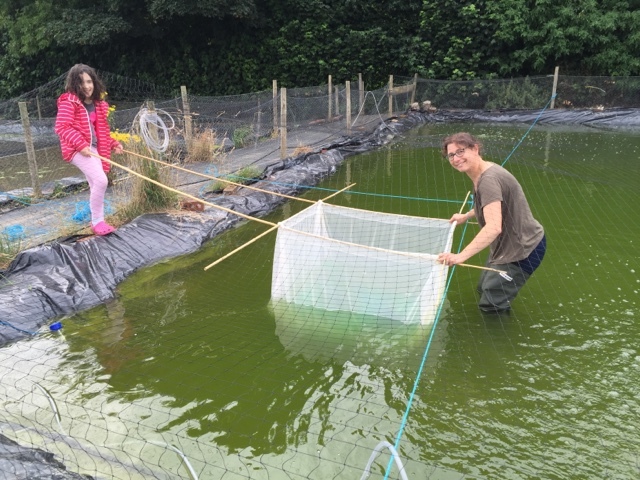 We have 3 batches of fry growing in the pond – all 3 batches are from the ‘sharkey’ spawning; there’s the original batch, where the eggs were reared within the actual pond itself, and then two more batches – one was a batch taken from the drained top pond, and the other batch was a top up of small fry that came from the eggs we reared indoors. We’ve never entertained mixing fry of different sizes in the same pond before, as it goes against common sense, but now we've done it, it’s an interesting exercise to see how it works. All the fry seem to be growing, but the most noticeable ones are the largest group – which I assume are the fry from the original batch… these are now at first selection size. And that’s a record for us – achieving 1 inch just 4 weeks after spawning. 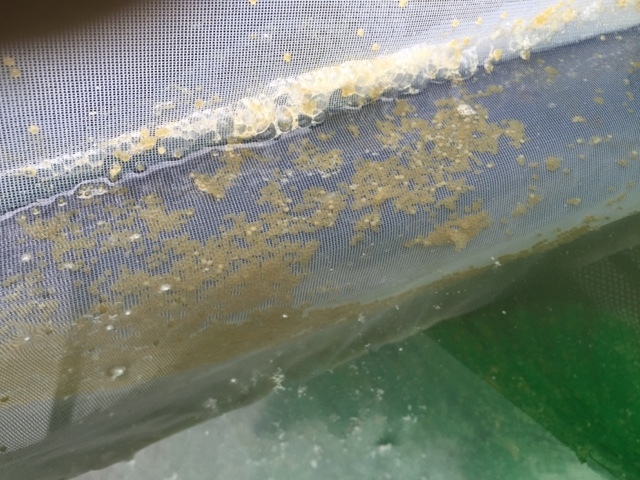 Shows how quickly the fish will grow given the correct conditions. 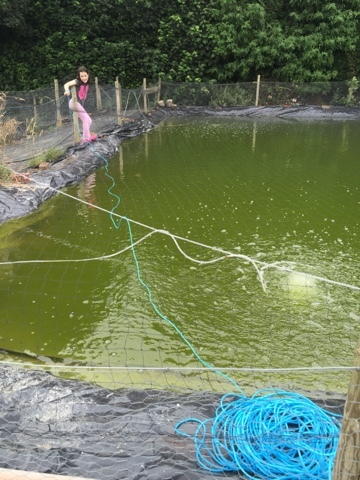 All we need to do now is to harvest the pond. My thinking is to thin out the pond by harvesting the larger fry – with the smallest ones probably slipping through the holes in the net. 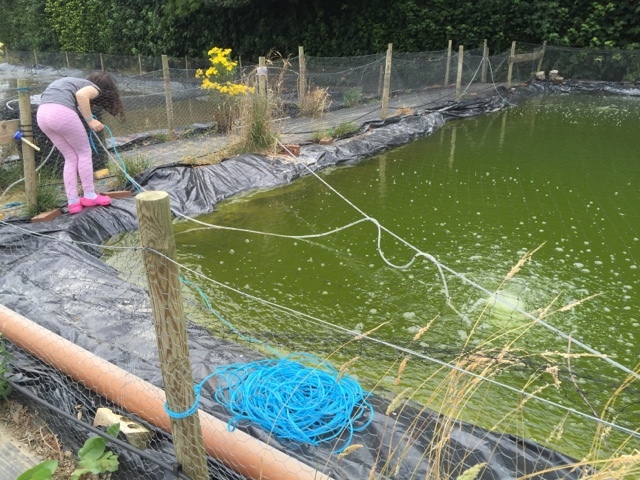 Then leave the pond for another week or two, before harvesting the rest. Problem is… we didn’t get to it last weekend. That I think was our last opportunity to carry out the plan ... because the smallest ones are still growing and by this weekend, they will probably be large enough to be collected by the seine net…..
We’ve tried to keep them out, but we’re coming up against the limitations in our time and there’s only so much we can do…. This winter, we’ll consider adding some finer hole size chicken wire to provide a tougher barrier to the newly hatched duck chicks. we gave our new 3 step kohaku a run out last weekend with our two trusty dianichi males. And she spawned on her first night! I’m so pleased. 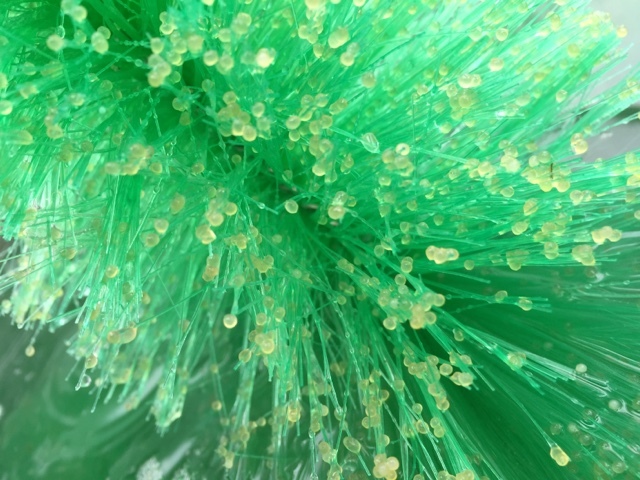 She was a big purchase for us, and it’s a massive relief that she actually spawned…. And I can report there are some fertilised eggs too. A decent number. So, this is good news. Ofcourse, whether any of them hatch, and turn out to be good koi or not is another matter, and only time will tell on that one. And, to be fair, when she was selected for me as a fish to breed from, the intention was to pair her with 2 of the males I lost in that disastrous spawning a few months ago. So, the males pairing is not the original one planned for her – nevertheless, we have fertilised eggs and that’s a good start. 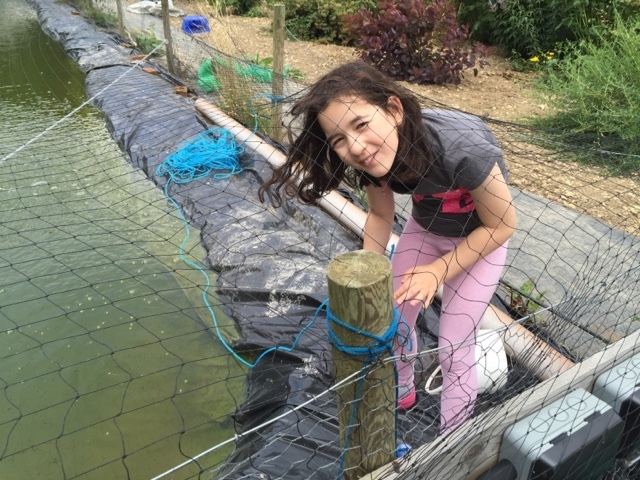 We split the eggs into 3 water volumes; 2 separate black tubs in the polytunnel, and also moved some into cage nets in the top fry pond outside. With the kids getting old enough to help out... My youngest daughter helped to lay out and set up the blue rope that we used as a mounting for the cage nets which you can see in the pic above. Here she is, picking up the rope at one side . I did suggest she swim across but fair enough , she preferred to walk around the bank. The top fry pond has been cycling much faster than normal, and it has started to go clear today. 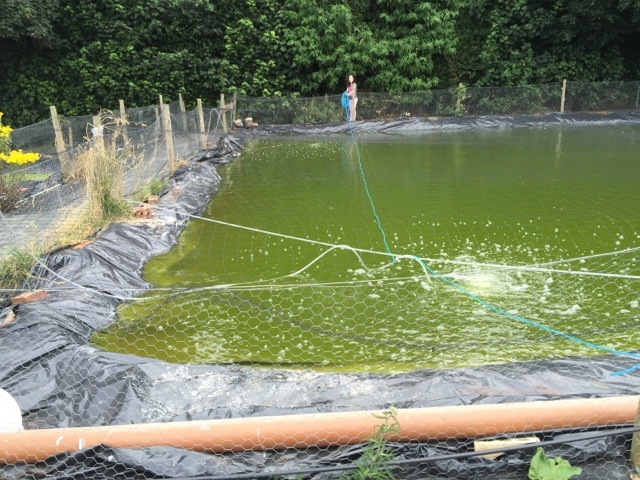 Very pleased with that; makes me think we might even get another use out of the bottom pond too.